Flattops are my specialty. 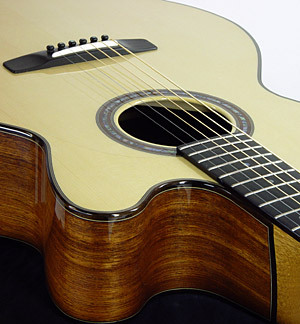 They are known for their clear, balanced tone, smooth playability, elegant styling and meticulous workmanship. These are highly refined guitars. I currently offer seven body sizes from the tiny 12" Seedling to the robust 16" Sequoia. Any one of these body shapes can be used as the foundation for a custom guitar. Select from the menu on the left to learn more about standard features and each of the models.